When you’re looking for a quick, flavorful side dish, nothing beats a stir fry recipe! I’ve now made these spicy green beans three times in the past week and twice they didn’t even make it to the table because we snacked on them right after they had their picture taken. You know that a vegetable side dish is a winner when your kids eat it straight out of the pan! The beauty of stir-fries is that they’re incredibly versatile. Don’t have enough green beans on hand? Add some shiitake mushrooms and bell peppers. 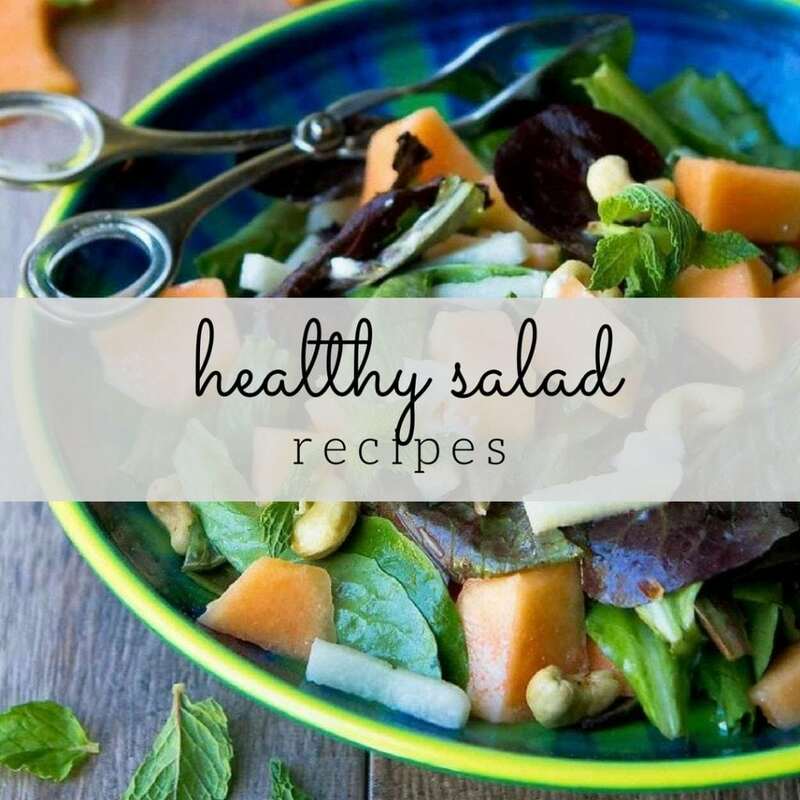 Are you looking for a full dinner idea, not just a side dish? Stir fry some chicken or shrimp first, then add it to the green beans with an extra dose of the sauce, and serve it over brown rice. So many options if you follow the general tips listed below! How do you make a good stir fry recipe? Most important tip…Be prepared! Things move quickly when you’re stir frying, so chop up the veggies, mince the garlic and ginger, and whisk together any sauces BEFORE you start cooking. I even go one step further by lining up the ingredients in glass prep bowls (affiliate link) in the order that they’re added to the stir fry. A little too far? Maybe. But it keeps me organized while cooking! Make it sizzle! Stir fries should be cooked at medium-high to high heat, using a wok (affiliate) or heavy skillet. Because stir fries are cooked at such a high heat, use oils with a high smoke point, such as canola or grapeseed oils. If adding sesame oil for flavor, stir it in when the vegetables are almost done cooking. It does not have a high smoke point, so will lend a bitter taste to the dish if cooked too long at a high heat. 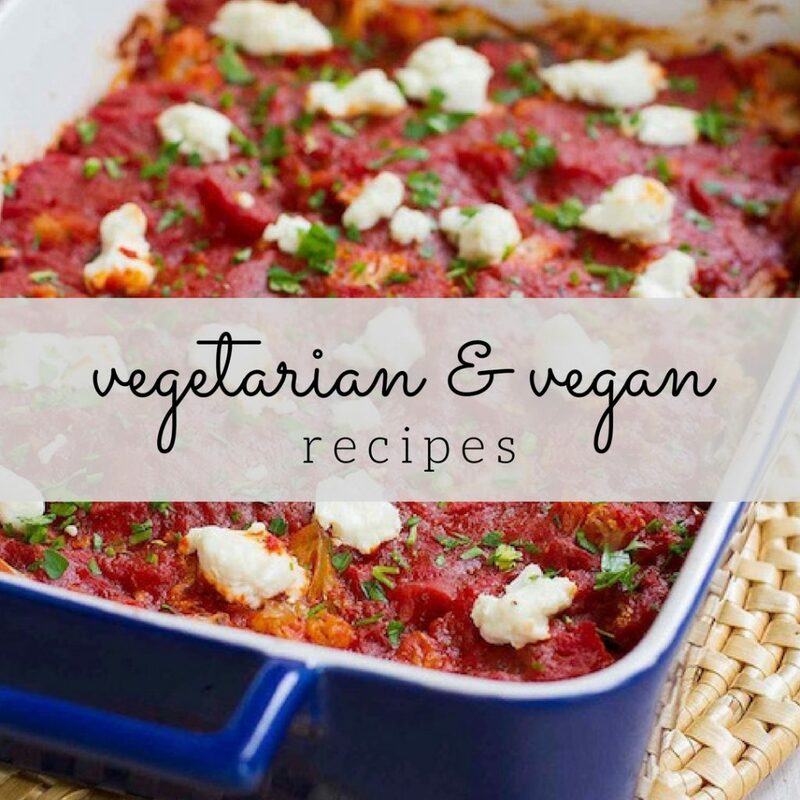 If you are adding a protein, such as chicken or beef, cook it first, then set aside while cooking the vegetables. Add the protein back into the wok with the sauce to reheat it. Cook the vegetables in order. What do I mean by that? First add the veggies that take the longest to cook, such as carrots and broccoli, and cook for 1 to 2 minutes. Next, add quicker cooking vegetables, such as snap peas. Add very delicate vegetables, such as bean sprouts, at the end. If you follow a gluten free diet, substitute tamari for soy sauce. In a small bowl, stir together the soy sauce (or tamari) and chili garlic sauce. Set aside. Heat a nonstick wok or large nonstick skillet over medium-high heat until very hot. Add the canola oil and heat briefly. Add the ginger and greens beans, and stir to coat the green beans with oil. 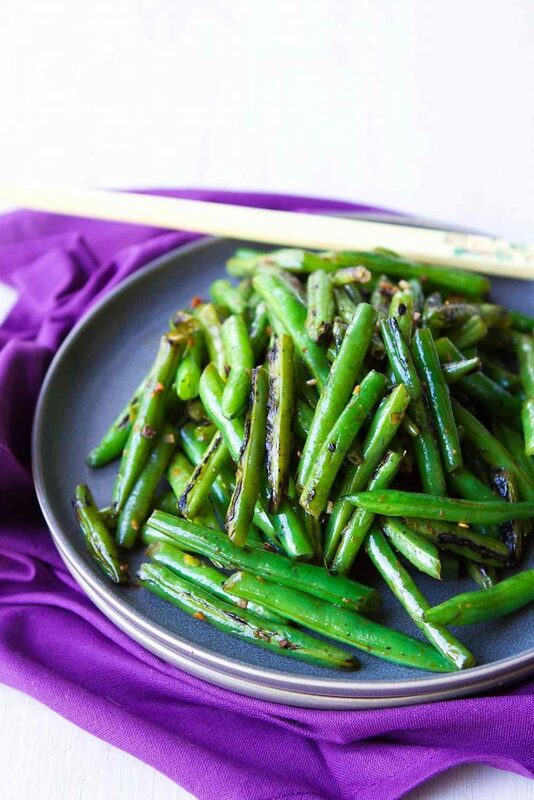 Spread out the green beans in the pan and allow to cook for about 3 minutes, stirring every 45 seconds, until slightly blackened and just tender when pierced with a fork. Stir in the sesame oil and garlic. Cook, stirring constantly, for 1 minute. Pour in the soy sauce mixture and stir until combined. Serve immediately. Quick, easy, tasty — what more could a cook ask for? Wow! Thank you for this recipe! I had a feeling it would be delicious. This would be great with any veggies, amazing simple sauce. 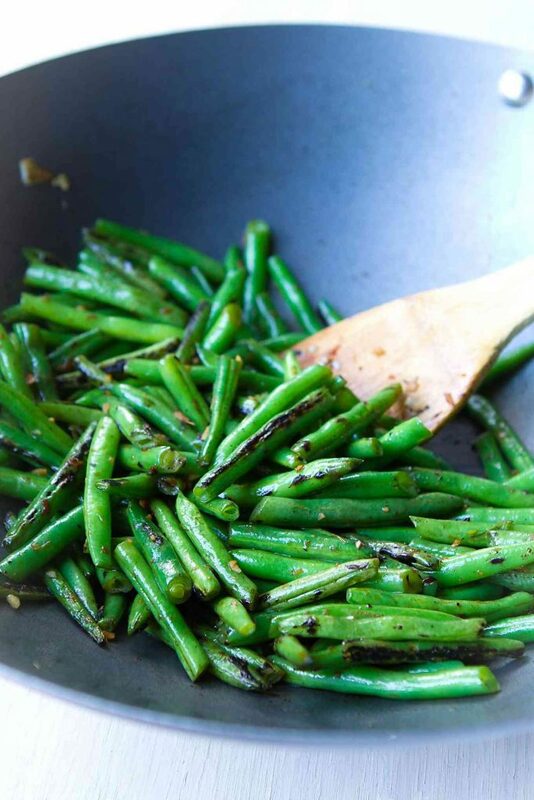 Green beans are one of my favorite additions to a meal! These look so good! 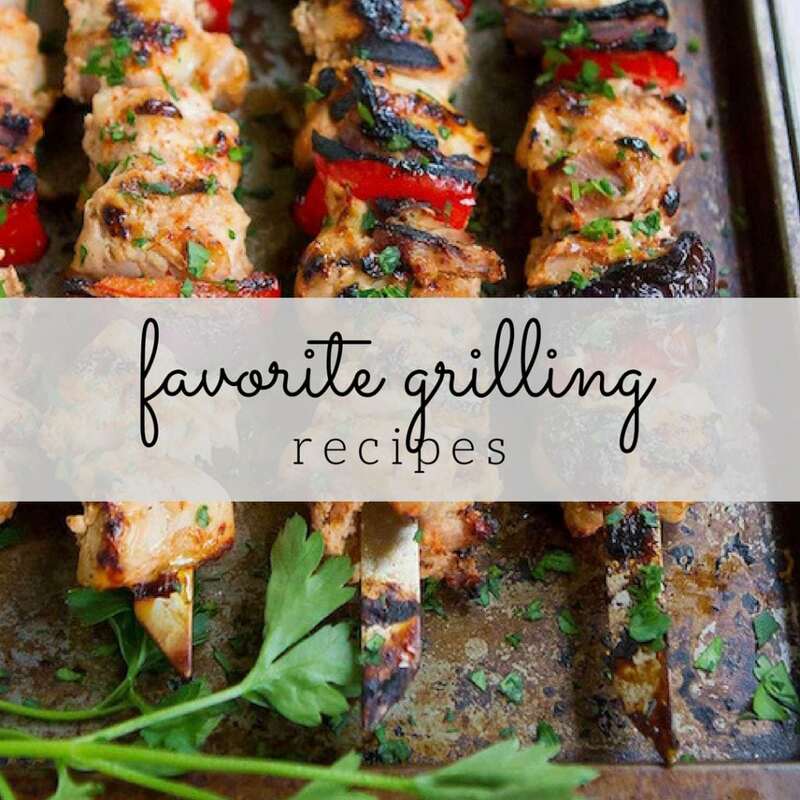 I make a similar recipe but without the chili garlic sauce—my family loves it! Now I need to try your yummy version! I love the simplicity of these green beans Dara! So yummy! And my kids would devour them too. I lovelovelove a simple stir fry! This has my name all over it! I love stir fry’s, they’ve saved me a ton of time in the past! This is my kinda dish! We had canned green beans for dinner last night and I actually thought, I wish I had a go to recipe so I could make fresh ones. This is perfection! 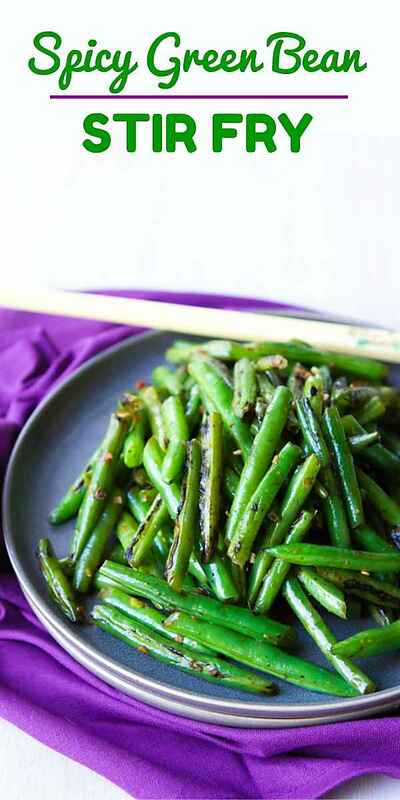 I love spicy and I love green beans, such a great dish! Made this for dinner tonight (and lunch for tomorrow). The only changes I made were using ground ginger since I don’t have fresh, added 1 teaspoon of chili garlic sauce and 1 tablespoon of soy sauce. The bites I stole from the pan before eating were really good!! I’m so glad to hear that, Melanie! 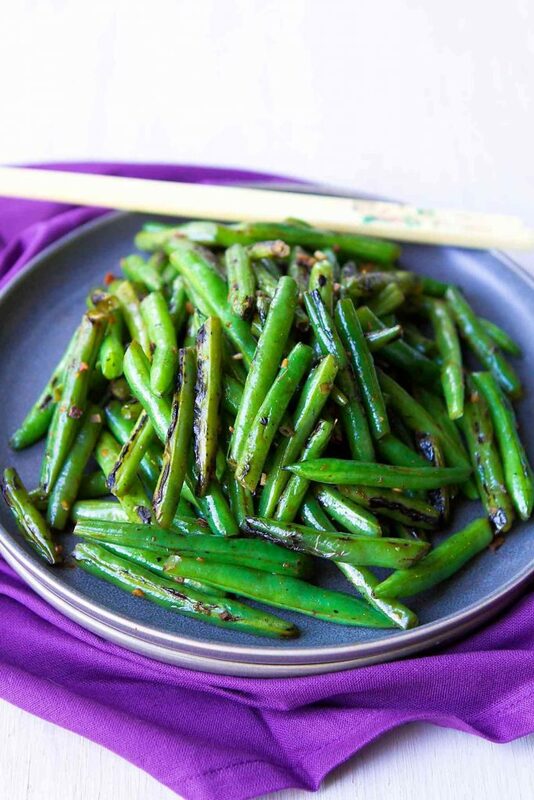 This is one of my favorite green bean dishes – always quick to put together. Hi Ann, I’m so sorry to hear about your health issues. I know that many people who avoid soy usually opt for Bragg’s amino acids, which can be found in many supermarkets and health food stores. Trader Joe’s even has their own version, usually stocked right next to the soy sauce.